Puneri Paltan vs Telugu Titans Live Score PP vs TT Pro Kabaddi League 2016 Live Streaming: Pro Kabaddi League Season 4 is going to kickstart from today with matches between Puneri Paltan and Telugu Titans. The very first match of the tournament is going to be played at SVP Stadium, Mumbai. First match of Pro Kabaddi League 2016 can be watched live through number of ways. The online live streaming of Kabaddi 2016 will be available on official websites. Star Sports network holds rights for online live telecast of matches. In Puneri Paltan, Captain Manjit Chillar along with Ajay Thakur and Akshay Yadav holds up great responsibility of taking the match to all side winnings while the other players will remain as positives. Somvir Shekhar and Gurpreet Singh are expected to take the defence in preference as per their past performance in the matches. Puneri Paltan was never a big team for the matches of Pro Kabaddi League but still many spectacular matches were performed from their end in past. Along with the mainstream players, PP also have Deepak Niwas Hooda and Dalbir as all rounders in the team to give Telugu Titans a edge to edge competition. Last year PP remains on higher position in comparison to the competitive team, TT. Telugu Titans didn’t have any specific titans of kabaddi in their team but has many stars of the series. Captain Rahul Chaudhari, Vinod Kumar and Nilesh Salunke are one of the top most players in entire series. Rupesh Tomar and Vishal Bhardwaj has great potential of beating the odds against Somvir Shekhar and Gurpreet Singh type of players. Telugu Titans holds up a strong attack while Puneri Paltan has one of the best defence in series. The round is going to be too much excited as the negative points will matter a lot. It would be interesting to see which team will be able to score more points saving its own players. PP is a team who has every type of players but in limited numbers. While, TT is a team of attackers and weak on defence. Anything could happen during today’s Pro Kabaddi League 2016 Live Streaming as both the teams has equal excitement of opening the account with a win. 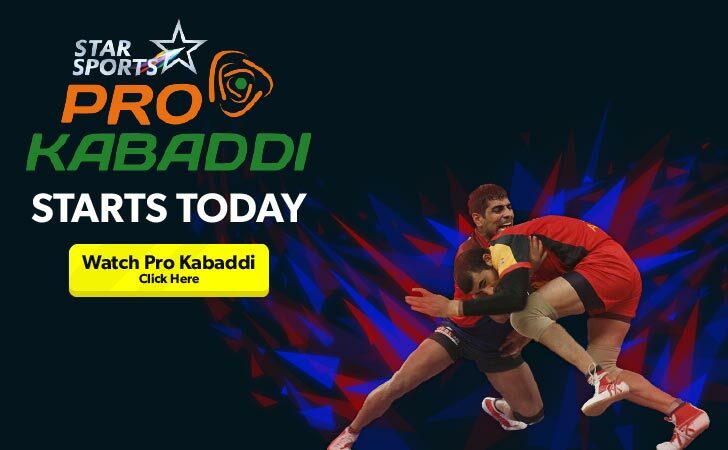 How to watch Pro Kabaddi season 4 match 1 Puneri Paltan vs Telugu Titans live, which will begin at 8 p.m. IST (3:30 p.m. BST) on July 25. Pro Kabaddi season 4 match 2: U Mumba vs Jaipur Pink Panthers will begin at 9 p.m. IST (4:30 p.m. BST) on July 25. It would be interesting match between Puneri Paltan vs Telugu Titans. This match will also decide the fate of teams in future matches.